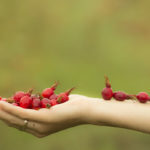 For the first time, the beneficial properties of “wild rose” berries – rosehip – were described in the IV century BC by “the father of botany” and naturalist Theophrastus. Since then, rosehip is widely used in traditional medicine, and with the development of the pharmacological industry, rosehip-based preparations have won recognition as official medicine. A rich set of vitamins, minerals and biologically active substances that the rosehip berries contain, cause a wide range of positive effects on the human body. The highest popularity was obtained by rosehip as a source of vitamin C. High content of vitamins B, A, E, K and P, minerals and tannins, pectins, saccharides and organic acids make the rosehip an irreplaceable source of biologically active substances. The biggest quantity of elements, such as calcium (Ca), potassium (K), manganese (Mn) and iron (Fe). According to iron content, rosehip is one of the first berries in the world. Also the fruits contain magnesium, phosphorus, zinc and copper. • promotes the synthesis of collagen. Beneficial effect on the condition of the skin, nails and hair. Accelerates the recovery processes, helps the healing of wounds and the fusion of bones after fractures. Promotes the regeneration of skin with burns and frostbite. In combination with vitamin D promotes the absorption of calcium in the body, plays an important role in the metabolic processes of bone and connective tissues. • restores strength when overworked, raises tone and mood, has a positive effect in nervous disorders. • improves vision, helps in the synthesis of visual purpura, is prescribed for the prevention of nyctalopia – a twilight vision disorder. 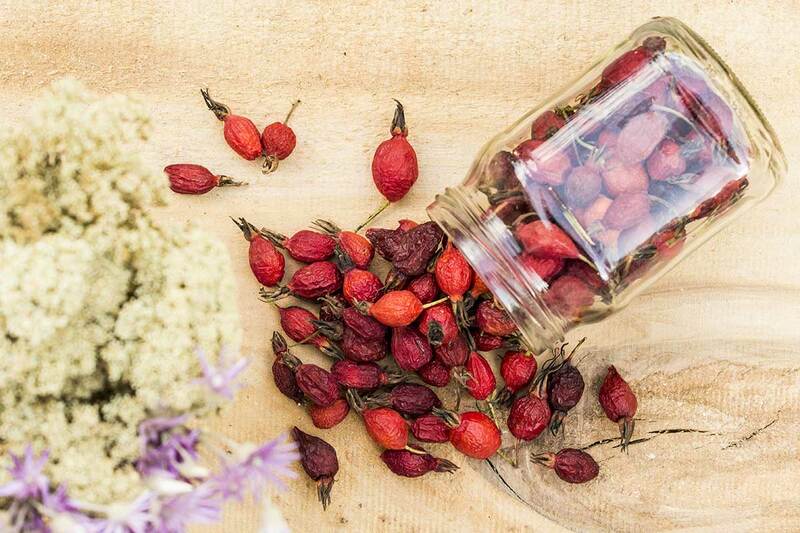 Rosehip is a real storehouse of vitamins and minerals. Why do we recommend using natural berries rather than synthesized vitamin-mineral complexes? Rosehip as a source of bioactive substances has several advantages over synthetic ascorbic acid. Firstly, in synthetic vitamin C, half the mass of the drug is in a form inaccessible to digestion by the organism, so, not only you do not get the necessary dose of vitamin C from the pills, your body gets an additional load to remove foreign substances. Secondly, ascorbic acid, used in organic form, being exact in natural rosehip pulp, does not cause complications, while synthetic vitamin C, in experiments on animals, has shown a hemolyzing effect on blood, causing anaemia and suppressing the body’s resistance, as a consequence of the inhibition of phagocytic activity of leukocytes! So instead of expected immunity and hemoglobin level rise, we get the opposite effect! Thirdly, data have been obtained that prolonged use of large doses of synthetic ascorbic acid may lead to inhibition of the insulin-forming function of the pancreas. All the above described, speaks again in favor of taking natural vitamins of natural origin. Man can not yet surpass nature, which created all the diversity of living forms on earth. One of her wonders is rosehip. To bring to you the whole benefit of this truly unique berry, we carefully collected it by hand, cleaned of stones and hairs, dried, observing the temperature regime that maximally preserves vitamins and nutrients. The gentle pink and red color of pulp prooves the quality, but the results of tests done in the Agency of medicines – the amount of vitamins. Given the unique high content of vitamin C in our product, we have more pleasant news: all these useful properties will be provided to you by ONE TEA SPOON of our rosehip per day.